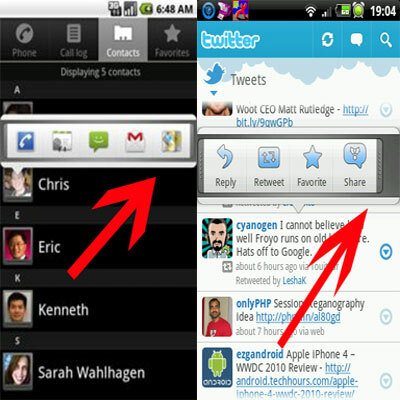 I want to create a custom dialog like Quick Contact in contact app or the one in official Twitter app. When i click on a button, it will be opened above or below the button. I've read the source code of Contact app but it seems to use internal API. The alternative solution is to extends Dialog class, i can set custom layout, but can't manage to position the dialog. Any solutions for this? The default orientation is vertical, so it will looks much different as you wish. You need to change the orientation in ExampleActivity from VERTICAL to HORIZONTAL. It have exactly what you need. You just have to merge it in your project and call right activity, it is very easy. There is also GreenDroid demo app on the market, it is called GDCatalog so you can test some of the features. And I think that there is a python script that merge GreenDroid in to your app for you. QuickAction is the demo in the app that you are looking for. It is very good looking too. Not the answer you're looking for? Browse other questions tagged android dialog popupwindow or ask your own question.